We were somewhat excited and kept our eyes peeled for the bridge that we needed to cross quickly. We passed at least 3 more warning signs. Yet no bridge. Could they really be warning us about the bridge over Trummelbach? Indeed. 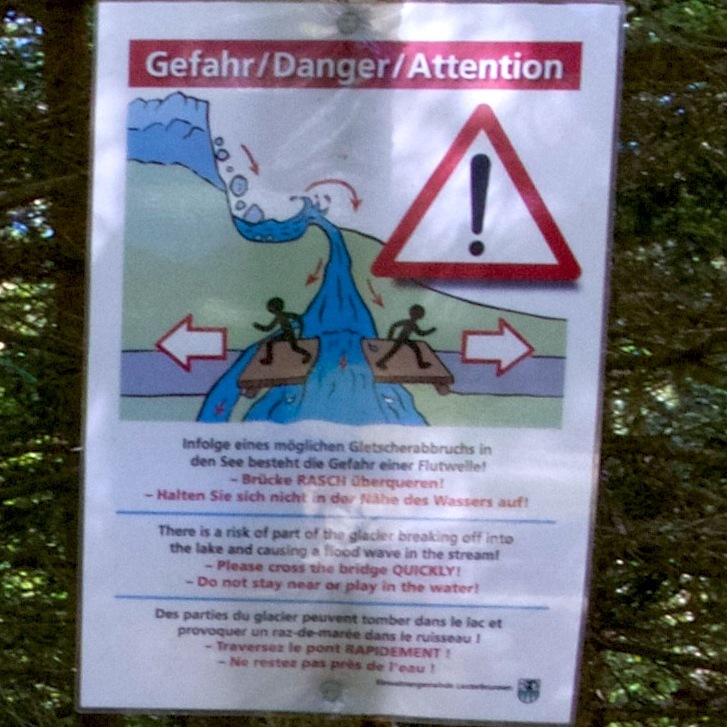 Approximately one hour and several more warning signs later, we crossed the bridge over Trummelbach Falls. Quickly. It was obvious water had crested the bridge only a few hours previously. Now that I’m home safely, I needed to satisfy my curiosity. What were the actual dangers? — the topic of this post. If you’re curious, though, I provide the details of our route. 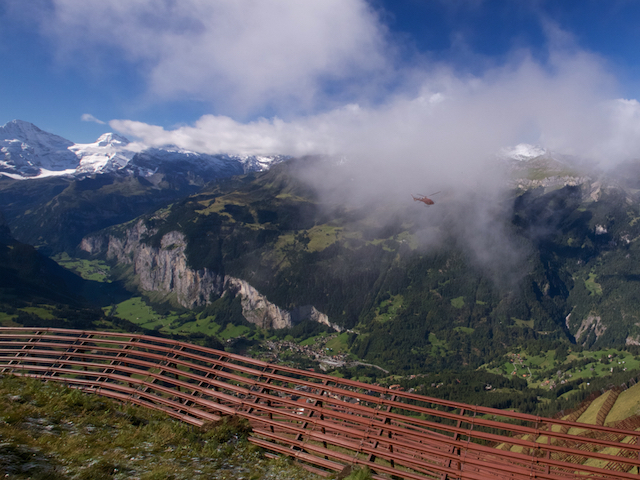 It’s not the usual way of hiking from Wengen to Lauterbrunnen. To pique your interest, we dubbed one segment “The Trail of Insanity” which had its own unique warning sign. At the bottom. Back to the sign with the sprinting hikers. Did they really need to warn us so soon? In September 2011, locals noticed a rift in the Giessen Glacier. When will it come to crash is unpredictable. It really is a massive amount of snow, ice and rock hanging on a steep cliff. 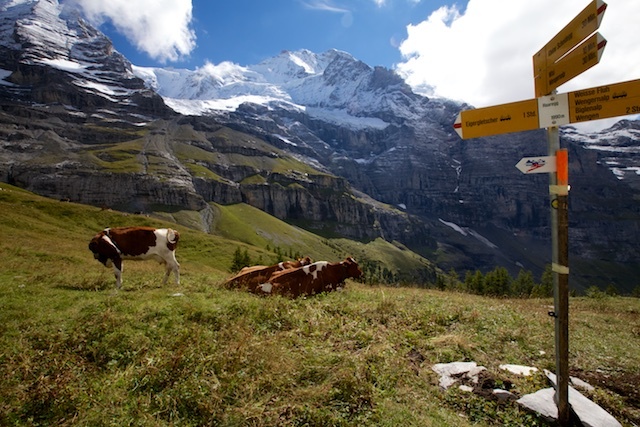 In the worst case the whole Lauterbrunnen Valley would be in danger. I’m not sure how high the water would rise, but the canyon is narrow – so potentially it could get high, quickly. Perhaps the signs were well placed. I’ve stared at the map and can’t see any lake that the sign references. So that’s confusing to me. 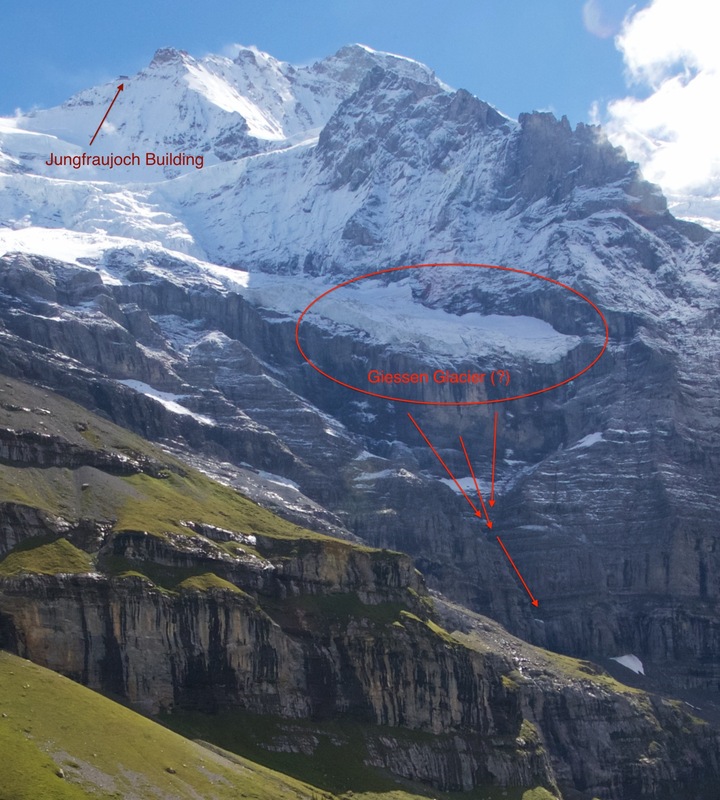 As glaciers recede on the Jungfrau recede, they leave masses of rock and sediment — moraines — on their edges. Sides of the mountain became unstable without the supporting pressure of the ice. They have closed portions of the trail we hiked when the glacier looks most dangerous. My day had started with a train to Wengen (1,274 m), from whence I began my climb to the peak of Mannlichen (2,343 m). I’ve included a photo of this map to show how the trail has been closed. 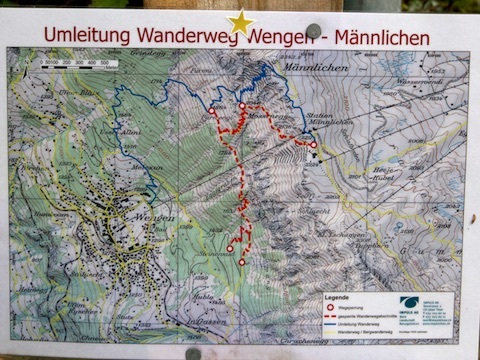 The trail we would prefer to take for the final ascent up to Männlichen (the last stretch of red at the top) is closed. In stead, rather than the gentle climb to the ridge, the blue trail switchbacks up over and between the avalanche-prevention fences. As an aside, I like the phrase “gesperrte Wanderwegabschnitte” meaning “locked trail sections,” simply because there is no actual “lock.” Rather than the sweeping trail which brings you to a spot just below the cable car statio (2,224 m) , the trail that is open switchbacks up the steep side of the hill and comes out just below the peak at 2,300 m. I soon found out the reason for the diversion. They were installing avalanche guards with the help of a helicopter. My climb up was quite noisy. The views were spectacular, but the trail was a muddy mess from the previous night’s melting snow. It was also a bit strange in that at times I had to crawl through the avalanche structures, something less nimble or larger hikers would have had difficulty doing. From Mannlichen Peak, I began the day’s descent. Wyssi Flue (1,835 m) at which point, we encountered a trail junction and made a decision that led to quite an adventure. Signs to Lauterbrunnen pointed both left and right; we didn’t feel like going through Wengernalp, so we chose left. At first, it was a mild, sweeping trail that roughly followed the contour of the land and only lost 100 meters. We came to another junction at 1,665 m and again went left. This trail descended over 500 m in a very short distance through Preeche where there was a sign toward Trummelbach Falls. That we were going that far up the Lauterbrunnen Valley (rather than closer in to town and the trail station) was a little alarming. But we forged on. The trail then had a series of steep switchbacks to Trimmleten. We found ourselves at the Trummelbach Falls (1,122 m) slot canyon. From there, we were a bit disgruntled to find that we needed to ascend a steep section (it turns out to be 200 m) in a very short time. This route is suitable only for experienced hikers! Good footwear is necessary! Then it was an easy walk on tired feet to the Lauterbrunnen Train station (795 m). Overall elevation loss = 1,548 m; gain = 1,069 m. Total mileage = ? I’m guessing around 20, but am not paying the 30 CHF (the hiking page cost to map a personalized route) to find out. Per our special talent, Don and I once again missed the train by less than 2 minutes but put the time waiting to good use by eating cookies and chocolate.